At EverLine Coatings and Services, our Toronto parking block and speed bump installation experts are committed to protecting your parking lot and keeping the people that use it safe. We have years of experience providing our industry-leading parking block and installation services to maximize the efficiency of your lot while preventing accidents. Our EverLine parking lot installation specialists have decades of experience with traffic control in Toronto. With our Toronto parking block installation services, we can protect curbs, pillars, walls, and other elements of your parking lot by preventing vehicles from bumping into them. By installing Toronto parking bumpers in the right areas, you can avoid costly sidewalk and curb repairs in the future. Even more importantly, we need to create parking lot layouts and speed bump layouts that are designed to protect your tenants, employees, and customers as well. This should be the number one thing that is kept in mind with every speed bump design in Toronto. With the right Toronto speed bump layout, we can ensure that vehicles do not exceed the speed limit while traveling around your parking lot. This is essential to protecting your parking lot users as well as your property. At EverLine Coatings and Services, we are the Toronto speed bump installation experts. We can install speed humps in Toronto to help ensure the safety of everyone that uses your property. EverLine Coatings and Services is committed to providing quality services and expectation shattering results with every project that it completes. Thanks to our commitment to delivering services that are unmatched by our competitors, we have established ourselves as the Toronto parking block and speed bump installation experts. We proudly use Canadian made reflective parking blocks and speed bumps on every project that we complete. These Toronto speed bumps are durable, visible and effective which makes them great for protecting your property and the people that are using it. At EverLine, we are committed to three key values that help differentiate us from other parking block and speed bump installation services in Toronto. These key values are, we continuously innovate our services, we provide systemized quality with every project, and we promise to always answer the call when you need our services. Our commitment to these key values is what gives us a competitive advantage over other service providers. Every client that we work with receives our highest quality of work. We will stop at nothing to ensure that our Toronto parking block and speed hump installation services are the best in the greater Toronto area. Thanks to our multi-crew approach, we are able to work around your schedule and provide our services when it is convenient for your business. We understand that interruptions to your regular business operations can be costly. We can provide our services when your business has shut down for the day to minimize the impact. Finally, we promise to always answer the call when you need us. We can provide our services with short notice or in the event of an emergency. At EverLine, we are proud to be considered the parking block and speed hump installation experts in Toronto. Thanks to our decades of experience with traffic control in Toronto and our ongoing parking bumper and speed bump installation training, we are able to deliver our clients the best possible results with every project. 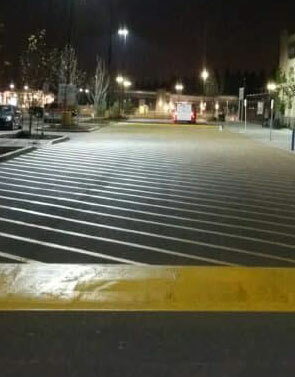 Our crews use the latest Toronto speed bump and parking block installation equipment to ensure they are on the cutting edge when it comes to installation techniques and Ontario parking lot safety standards. Our expert Toronto speed bump and parking bumper installation crews have seen and done it all. They have worked with many different parking lot configurations to create parking lot layouts and speed bump layouts that are effective and safe. Their unmatched combination of experience and rigorous training has established our parking block and speed bump installation crews as the parking lot safety experts in Toronto. If the Everline Coatings and Services Toronto parking bumper and speed bump installation experts are coming to install traffic control devices at your property in the near future, there are a few steps you will need to take to prepare. First, please ensure that the parking lot surface has been cleaned and is free of any debris. This will ensure that our crews can install parking blocks and speed bumps in a timely manner. Also, please put up signs and post notices around the property to alert motorists that our crews will be installing parking blocks and speed bumps in Toronto. This will ensure the safety of our crews and ensure that there are no interruptions while they are installing speed humps and parking bumpers in Toronto. At EverLine, we firmly believe in putting our best foot forward and delivering the best results and value with every job that we complete. For that reason, all of our pricing is evaluated on a per job basis. We assess your parking lot and property to determine what your needs are and how to create a safe Toronto traffic control solution for your business. Once we have an understanding of what your needs are, we will work with you to determine a parking lot solution that fits within your unique budget. If you require a quote for your upcoming Toronto parking block and speed bump installation project, please contact us for a free estimate.